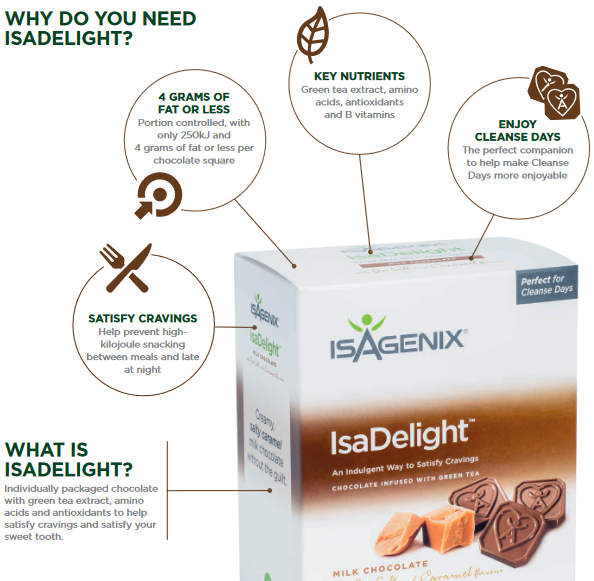 Curb your sweet tooth with Isagenix IsaDelights. They’re a guilt free chocolate that will satisfy your sugar cravings while containing your essential amino acids and B vitamins. IsaDelights have added antioxidant-rich green tea which helps promote cardiovascular health. Each box comes with 30 individually wrapped servings. All first orders come with 30 day money back guarantee! Further info found here. Delicious Chocolates in 3 Yummy Flavours! These scrumptious IsaDelight treats will give you the strength to dominate your cleanse days and take control of your cravings. 1-2 servings on cleanse days will give you the energy and boost your metabolism you need. 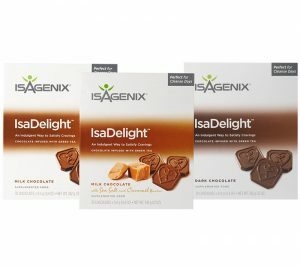 Each box comes with 30 Isagenix IsaDelights and each serving is approximately 50 calories.